NEW YORK, New York — Armenia Fund USA has taken critical steps to enhance and modernize healthcare and medical education in Armenia and Karabakh with the establishment of its newly branded HyeBridge Telehealth™ program. This initiative, worth hundreds of thousands of dollars, dates back to 2004 when the Fund pioneered a pilot project in telemedicine. Since 2004, Karabakh Telecom has generously provided free, high-speed Internet access to the newly built Polyclinic in Stepanakert, connecting the biggest healthcare hub in Karabakh to the international medical community. Telemedicine as a field is relatively new to the healthcare community. The tool has been widely utilized to overcome challenges of time and distance when it comes to prompt and precise medical diagnosis and information exchange. Through high-speed Internet access and a centrally controlled electronic communications database, medical and healthcare professionals are able to diagnose and treat critical conditions that sometimes require highly specialized experiential knowledge or expertise that is otherwise unavailable at a given place and point in time. Having already invested in Karabakh’s healthcare system, Armenia Fund came up with the ambitious plan of making the Armine Pagoumian Polyclinic part of what is to become a nationwide network of electronic diagnosis and an information sharing platform. An initial HyeBridge Telehealth center was established in Karabakh in 2005. 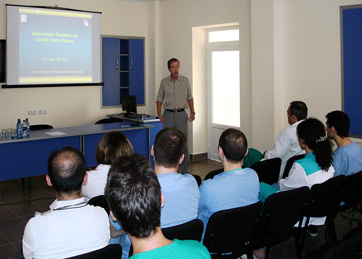 In 2009, Armenia Fund USA arranged for computers and additional equipment installation that would allow, via electronic telecommunications, the exchange of medical information between Armenia’s Yerevan State Medical University (YSMU) and medical professionals practicing in remote regions of Armenia and Karabakh. This past summer, Vanadzor Hospital #2 joined the HyeBridge Telehealth international community, becoming the fourth project site. This year alone, 22 computers, 2 Polycom videoconferencing units, and other critical surgical supplies (a total value of $45,500) have been airlifted to HyeBridge sites, courtesy of United Armenian Fund, an indispensable player in bringing valuable specialty equipment and technology directly to the designated recipients. The undeniable success of the pilot session indicated that “telemedicine is an effective and cost-efficient driver of improved medical outcomes in Armenia,” in the words of Armenia Fund USA Executive Director Irina Lazarian. Telemedicine includes such applications as videoconferencing, transmission of still images, remote monitoring of vital signs, continuing medical education, and even nurse-advisory call centers. “For Armenia and Karabakh, this technology is the next best thing to in-person consultations and on-premise clinical and classroom training,” Ms. Lazarian goes on to say. This summer, videoconferencing equipment was installed at the Armenia Fund USA headquarters in lower Manhattan in preparation for a series of live consultations to be transmitted in real time. 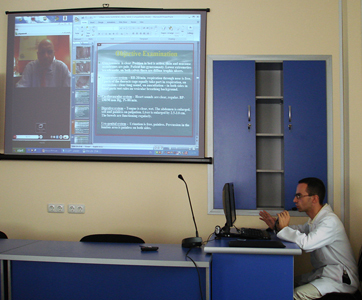 Doctors Tsoline Kojaoghlanian and Vicken Pamoukian spearheaded the telemedicine sessions with Armenia. Reiterates Dr. Kojaoghlanian, a Pediatric Infectious Diseases specialist at the Children's Hospital at Montefiore in New York and a member of the Armenian American Health Professionals Organization (AAHPO), "At the live session in July, I was able to see one year-old A.B. and his pediatricians in Yerevan who were working on diagnosing a rare metabolic disorder that made A.B. very sick. Together, we reviewed his history and work-up and decided upon the final few laboratory tests, establishing a future plan of action. Such is a superb example of what is vital to medicine both within the US and abroad—experts coming together to diagnose and treat a difficult condition, sharing their experiences and ideas for a comprehensive plan of management." “Fortunately, many of today’s younger physicians in Armenia speak English and many of our local participants speak enough Armenian to make the video-consultation a fluid and productive discussion,” Ms. Lazarian adds. Under the HyeBridge Telehealth banner, a demonstration was presented in July 2009 at the 10th Annual Armenian Medical World Congress in New York City. Four difficult patient cases were consulted with the use of the electronic technology and over 400 doctors and nurses from YSMU participated in the conference remotely. The response was so enthusiastic that the American-Armenian Health Professionals Organization (AAHPO) announced, at the Congress banquet, its decision to join HyeBridge Telehealth as a principal partner. Its involvement is consistent with the AAHPO mission: to improve healthcare awareness and increase disease prevention while providing medical support and education. The collaboration between the Armenia Fund USA Eastern region affiliate with YSMU and AAHPO doctors, dentists, nurses and pharmacists practicing in NY, NJ and CT, combines the world-class expertise of medical specialists in the U.S. with the vast field experience that Armenia Fund USA possesses in program implementation for Armenia and Karabakh. At the same time, YMSU manages scheduling of video-seminars and video-consultation in Armenia and provides guidance and advice on telemedicine content design, based on the subject areas of greatest interest and most urgent need among professional counterparts in Armenia and Karabakh. Aside from video-consultations, the telemedicine partners have taken the next logical step: arranging for recognized specialists, such as Dr. Jiri Vitek, to visit Armenia. Over the last 10 years, Dr. Vitek narrowed his interventional neuroradiological practice to carotid artery stenting and carotid atheromatous disease. He agreed to make a presentation on his specialty and was gratified by the response. “I enjoyed being in YSMU hospital and was surprised by the number of physicians interested in carotid stenting. It was a pleasure meeting the chief of Radiology and all young physicians,” Dr. Vitek remarked. 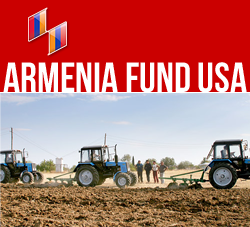 In the States, Armenia Fund USA continues to gather support for the project. On a summer evening in Manhattan in mid-June, Armenia Fund USA’s “Sunsets on the Hudson” event garnered more than 150 young professionals and community leaders to raise awareness and funds for HyeBridge Telehealth’s establishment of new telemedicine hubs in Armenia and Karabakh. Margot Takian, Armenia Fund Board member and a steadfast supporter of young people’s involvement in the Fund’s mission, chaired the event committee, matching the night’s donations to arrive at the total and generous contribution of $5,000, all of which was achieved while jovially mingling over cocktails. A major focus of the project has been engaging the medical community in Armenia to more actively share information and keep appraised of the best practices. Teleconference-style lectures are routinely organized to keep doctors and healthcare professional up to date on important medical themes and new research findings. Such a purpose appealed to young professionals from all walks of life at the June 17th event. “Doing so much with so little, it is fascinating! This is an organization that has more than 18 years of experience in building from the ground-up – schools, hospitals and clinics, roads and houses, you name it. I think the Fund has a great opportunity to leverage that experience with this very innovative telemedicine program. We, as young people, have a duty to understand the long-term implications of such projects. This is an investment in the future of Armenia because HyeBridge Telehealth has critical education and training components to it,” expressed Arpine Kocharyan, who helped organize the event. In October 2009, HyeBridge Telehealth applied for and was granted membership in the American Telemedicine Association (ATA), which extends member rights to all HyeBridge Telehealth partners: Armenia Fund USA, AAHPO and YSMU. This affiliation promises to significantly expand global healthcare networking opportunities for HyeBridge Telehealth members while providing access to resources designed to advance telemedicine in developing nations, such as Armenia and Karabakh. 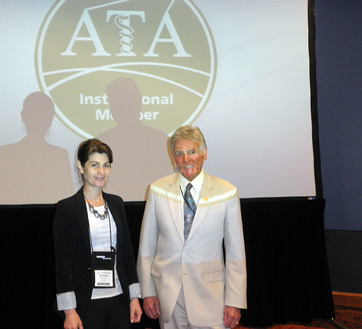 As a new institutional member, HyeBridge Telehealth was invited to participate at the ATA Annual Conference in May 2010 in San Antonio, Texas. In addition, the head of ATA has agreed to participate, via videoconference, in selected telemedicine sessions that the YSMU has organized around its 90th Anniversary events as well as professional conferences this October 6-11 in Armenia. “By forging strategic partnerships between medical professionals in the diaspora and Armenia, supported by technologies that facilitate the instant exchange of up-to-date information, Armenia Fund USA has solidified its role in helping to bring Armenian medical practices up to world-class standards,” stated Raffi Festekjian, chairman of Armenia Fund USA.